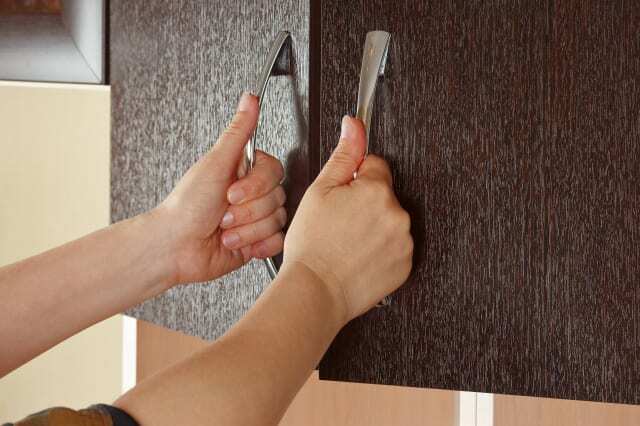 ShutterstockA telltale sign of rushed work: doors or cabinets that don't close tight. Buyers often assume a flipped home is like new -- move-in ready and free from hassles. The newly renovated home gets top dollar, and the buyer assumes it is perfect. Most buyers, however, don't realize that some contractors or property "flippers" are anxious to move on to the next job, and their work may be rushed and subpar as a result. If you're buying a flipped house, consider taking the following steps to ensure you don't get any unpleasant surprises after closing. Be Vigilant: As tempting as it can be, try not to get caught up in the excitement of new appliances, marble baths and other fancy bells and whistles. By looking closely at the details, you can learn a lot about the quality of work done on the property. Light switch plates that aren't flush with the wall or are at an angle. Crown molding that isn't completely matched at the corner. Gaps between the countertops and the wall. Doors or cabinets that don't close tight. Cosmetic mistakes could be an indicator of larger issues that can't be seen with the naked eye. If the flipper was sloppy on the small details, pay extra attention to other areas such as the electric panel, the water heater's gas line and plumbing connectors. Get an inspection: Most buyers assume that a newly renovated house is, well, new. And, because of that, they don't need to have it inspected. That is not a great approach. An inspector can check the contractor's work. Were renovations done to code? Did the contractor cut corners or do the bare minimum in places because of a tight time frame? Sure, the town/city likely would have had to sign off on the renovations, but city officials are only looking at health and safety issues. The home inspector can check the house from top to bottom. It's worth paying for an inspection to ensure the home is perfect. Double your due diligence: When buying a flipped home, it is more important than ever to review the disclosures. Did the contractor take out permits for the work? If so, were all the permits signed off on? If you aren't given copies of all the work approvals or finalized permits, ask for them. If you don't get them, look them up online or go to the local building department. Any permits taken out or applied for (and officially signed off on) are public record. Never close on a home without making sure all permits were cleared. Otherwise, as the new homeowner, you could be on the hook for illegal or bad work. Learn all you can about the flipper: Is the flipper an experienced contractor with a good reputation in your local town/community? Ask your agent if he/she is familiar with the flipper. Good flippers have been at it for a long time, and their reputations precede them. A flipper with a solid reputation should have nothing to hide and should be open and free with disclosures and provide you with documentation and warranties. Good home flippers want happy customers, too. They don't want calls from buyers or attorneys a year later with complaints about their work or liability issues. In the past 18 months, there has been a marked increase in the number of homes bought simply to be renovated and put back on the market. While many times the improvements are done well, often the contractor or flipper cut corners or rushed through the project, simply to move on to the next one -- leaving the new homeowner with a nightmare on their hands. Flipped homes should always be double- or triple-checked for potential issues. Inferior work could end up costing you money and headaches in the long run. Brendon DeSimone is the author of Next Generation Real Estate: New Rules for Smarter Home Buying & Faster Selling, an insider's guide for navigating and better understanding the complex and ever-evolving world of buying and selling a home. DeSimone is the founder and principal of DeSimone & Co, an independent NYC real estate brokerage providing individualized services and a fresh, hands-on approach. Bringing more than a decade of residential real estate experience, DeSimone is a recognized national real estate expert and has appeared on top media outlets including CNBC, Good Morning America, HGTV, FOX News, Bloomberg and FOX Business. Consumers often call on Brendon for advice and to help them find a real estate agent. You can follow him on Twitter or Google Plus.